4. Ear structure damage: middle or outer ear damage, infections, etc. What drugs are ototoxic? Depending on the article, I've seen estimates from 200-800 different drugs as being ototoxic. Some of the more common ones are chemotherapy drugs (cisplatin), certain beta-blockers, antibiotics, antidepressants, aspirin, and diuretics. Not all drugs within these classes are ototoxic, but some are. 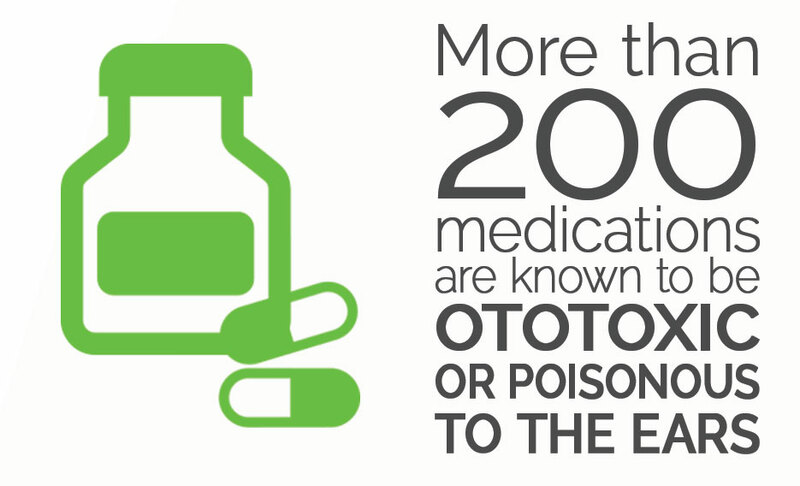 If you're on any kind of prescription medicine, check with your physician about ototoxic side effects and whether there are other alternatives with non hearing related consequences. In addition, one's absorption of the drug impacts the side affects, as well as any genetic propensity for hearing loss, kidney damage, or exposure to loud sounds. Frequency and dose are also factors. As always, talk with a physician if you believe your medication to be impacting the structures of your ear negatively. Pharmacological Drugs Inducing Ototoxicity: An updated guide This is a very thorough and scientific article examining this issue from the European Review for Medical and Pharmacological Sciences. Ototoxicity- the Hidden Menace by Neil Bauman. Although this is an older article, it shares some of the narratives of ototoxicity and many of the specific drugs impacting the ears.